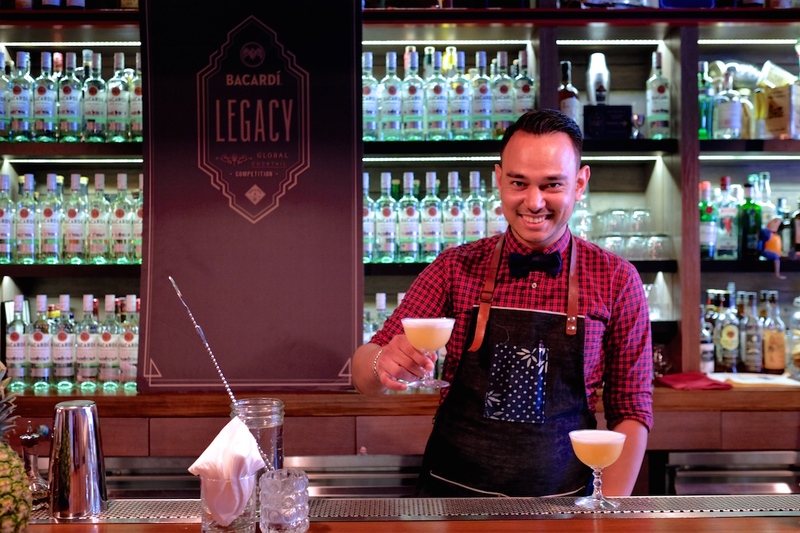 Earlier we reported that the ongoing Bacardi Legacy Cocktail Competition 2016 had shortlisted its top five Singapore finalists that will see the eventual winner represent the country to compete at the global finals in San Francisco in April of next year. Now each of these five finalists have come up with a special cocktail – using Bacardi rum, of course – that they deem is exceptional enough to become a classic that can rival the likes of the iconic daiquiri or mojito. Their creations need to be impressive not just in flavour; they must also be something that bartenders and mixologists across the world feel inspired enough to recreate and perpetuate. But they’re going to need your help as well – as part of the challenge, each finalist is supposed to lead the marketing of their drink at their respective bars, and is responsible also for promoting their drink on social media. In fact, part of their scoring depends on how popular their drink will be on social media platforms such as Facebook, Twitter and Instagram, which will go towards their final score that decides who will ultimately represent Singapore on a global stage. The national finals will take place in March next year, so you have from now until then to lend them your support – by voting with your wallet, but also by lending your social media presence to promote their legacy creation. 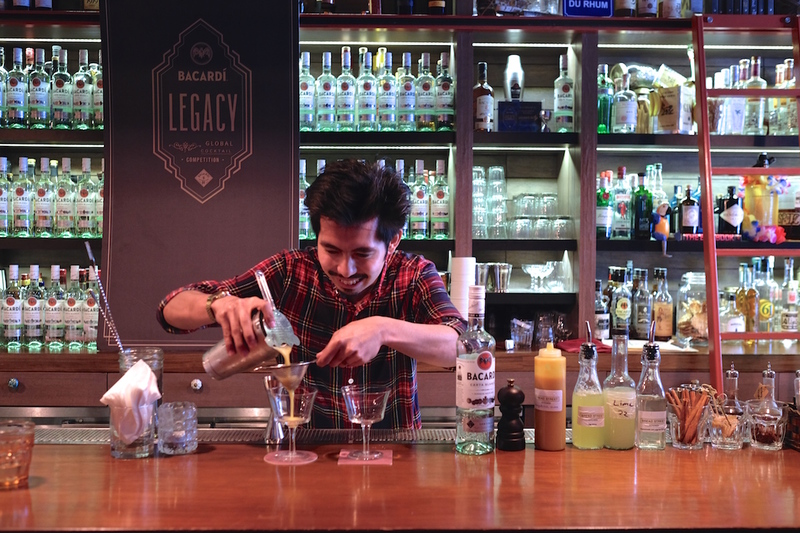 So help cement Singapore as a shining light on the global mixology scene by voting and plugging for the best we have, and get that person on the world stage and win the Bacardi Legacy Cocktail Competition next year. Let’s send a worthy winner there. By the way, during the global finals in San Francisco each of the finalists need to eloquently present and make their cocktails within 7 minutes. You can help them practice by not just ordering their creations, but getting them explain their thinking behind their legacy cocktails so their presentation becomes second nature. Bread Street Kitchen’s Reyes pays tribute to his Filipino roots with his ‘Tanggero‘, named after the leader of a tagay, the drinking custom practiced in the Philippines, who is responsible for opening a bottle, pouring the drink into the glass and then passing it to the next drinker. Reyes’ ‘Tangerro’ combines Bacardi Carta Blanca with lime juice, chilli-spiked mango puree, lemongrass syrup, and egg white for body, then garnished with a stick of lemongrass and some salt. Expect this tipple to taste somewhat like the cocktail version of a Som Tum Mamuang (Thai mango salad). 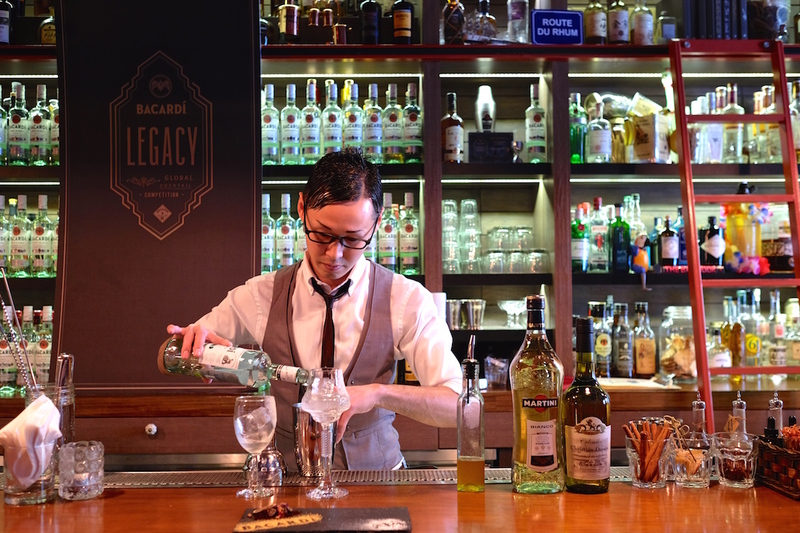 Quiet but assertive Japanese native Satoshi Iwai of Orgo takes inspiration from Bacardi’s struggles – originally from Cuba, Bacardi fled the country after the Castro regime confiscated the company’s Cuban assets on 15 October 1960 and was forced to reestablish itself in Bermuda – to create his Legacy drink called ‘La Felicidad‘, or happiness. Iwai’s ‘La Felicidad’ is a potent concoction that includes a goodly shot of Bacardi Superior mixed with vermouth, Calvados and a honey and Tio Pepe fino sherry reduction that will make you incredibly happy… and drunk. 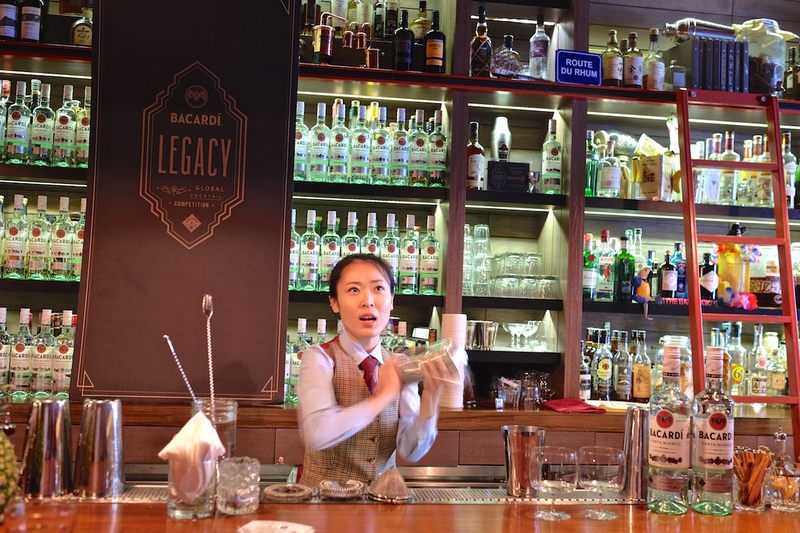 Pint-sized powerhouse Bannie Kang – winner of Best Female Bartender at last year’s Singapore Bar Awards – looks to her Korean heritage and finds inspiration for her legacy creation in the hwachae (화채), a traditional Korean punch made with various fruits or edible flower petals. Her ‘Hwachae‘ is an alcohol version that marries Bacardi Carta Blanca with muddled watermelon, pineapple juice, lemon juice and a dose of beer. It’s floral and fruity, with a subtle alcoholic bite. There’s going to be quite a bit of pressure on Sugarhall’s representative Stuart Danker; after all, Sugarhall is pretty much Singapore’s house of rum. His entry, ‘Legado Rosa‘ (legacy of Rosa), is named for his grandmother Rosalyn – Danker shares how she persisted in caring for the family’s passionfruit tree despite it never having fruited, which taught him tenacity and spirit. ‘Legado Rosa’ puts together Bacardi Carta Blanca, passionfruit syrup, fresh lime juice, egg white for body, angostura bitters and completed with a spritz of mezcal for a powerful tropical fruit punch. 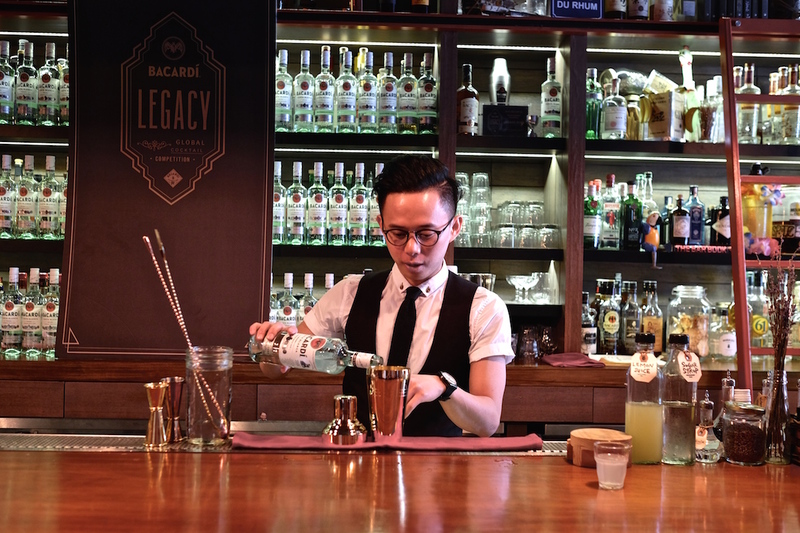 Danker’s compatriot from Sugarhall’s sister outlet Jigger & Pony, Sin Kim Shin, may have considerably less pressure on him, but the young Malaysian bartender puts out a strong contender with his creation ‘Butterfly Effect’. ‘Butterfly Effect’ pays tribute to those people he has met along the way who’ve helped him become who he wants to be, and what he wants to do in his life – to make people happy with his drinks. It’s a most intense floral concoction made with Bacardi Carta Blanca, lemon juice, sugar syrup, and shaken with dried lavender buds before being strained.